Broken capillaries occur from generalized photodamage (exposure to the sun without sunscreen) over time and rosacea patients are even that much more susceptible to the red cheeks which are caused by centrally located broken vessels. While topical medications and oral medications prescribed will certainly help with the inflammation of rosacea, once the visible signs of broken capillaries are present the best treatment is with an IPL and or Pulsed Dye Laser. 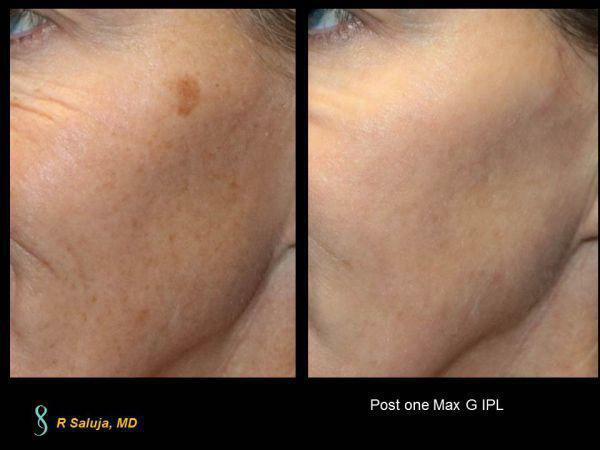 At Saluja Cosmetic and Laser Center we have both IPL and PDL and often times, the Max G IPL is all that is needed. 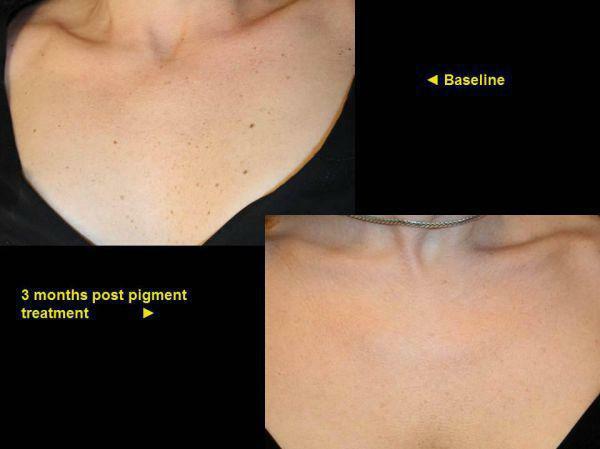 Pigmentation of the Chest is a very common complaint that we hear from patients in Charlotte, North Carolina. While we remember our sunscreen on our face (one of my favorites is Elta-MD), we forget to place sunscreen on our neck and chest. 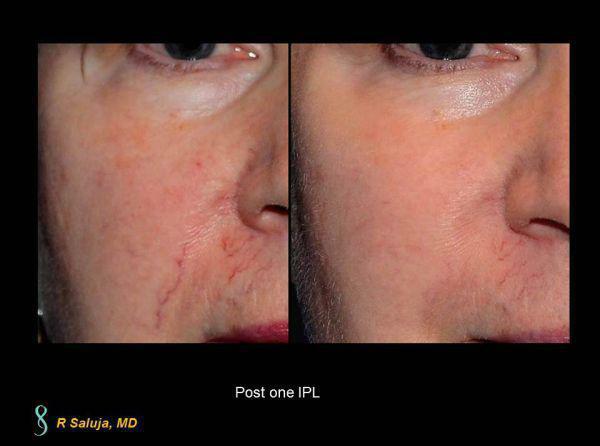 The fall and winter is a good time to have a series of IPL's to improve the pigmentation. Photodamage, in essence, means premature aging of the skin from chronic UV exposure. It typically appears as pigmentation, broken capillaries and loss of elastin and collagen. One of the most common areas that we see this is on our chest (decolletage). While we recommend 1-3 treatments, depending on the level of damage to the chest, here is a Charlotte, North Carolina patient who is status post one treatment to the chest with a YS IPL. 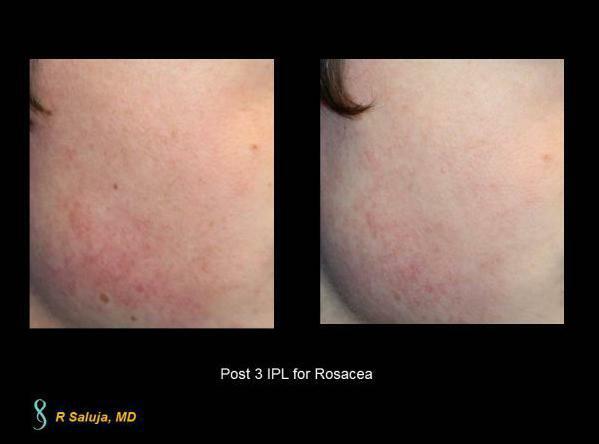 This is a photo of post 3 Max G IPL for recalcitrant rosacea. Typically treatments for rosacea are separated by 6 weeks to maximize the clinical effect after each laser. Sun damage is common in Huntersville, NC with hours spent at Lake Norman in the summer. Sun protection is imperative with SPF of at least 30. This is a patient who presented with pigmentation and broken capillaries. 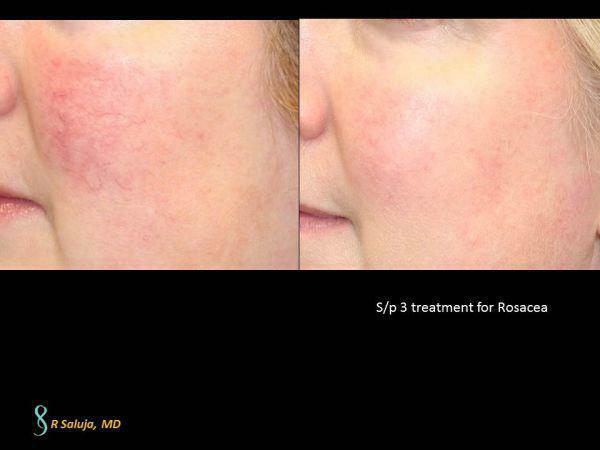 While we typically recommend 1-3 treatments, these are her results post one IPL. Many patients suffer from rosacea which results in red cheeks primarily in the central part of the face. This patient from Huntersville, NC has broken capillaries in the center part of the face. We treated with an IPL to help minimize the appearance of the facial vessels which also improved the rough feel of her skin. Max G IPL by Palomar can freshen up the face in just one treatment. This Huntersville, North Carolina patient had one treatment which helped minimize the pigmentation. Years of sun exposure can give photodamage to not only the face/neck and chest but also the extremities. 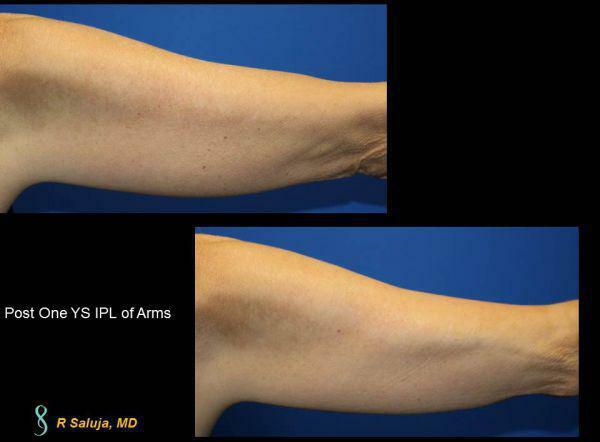 This is a patient who is status post one treatment to the arms. We typically recommend at least 2 treatments and they are best performed when the arms are not tan. It typically takes 2-3 weeks for pigmentation on the arms and legs to come to the surface and shed. We simply cannot wear gloves through our life and therefore we expose our hands to UV radiation on a daily basis. Remembering to place sunscreen on our hands will save us from developing the sunspots that so quickly age us. When these spots do appear, a great way to treat them is with an IPL which targets the melanin (pigmentation) to effectively treat the area and minimize the brown spots. 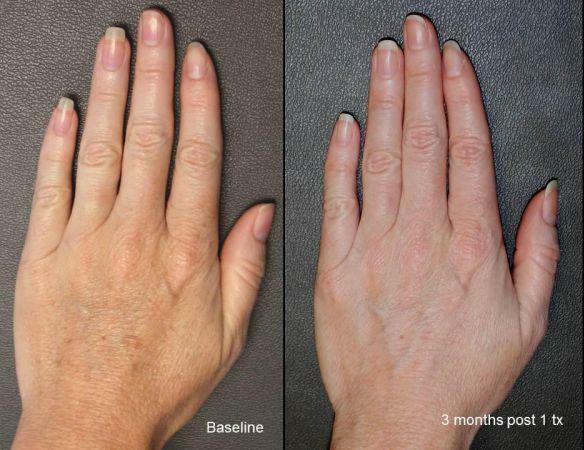 This Huntersville, North Carolina female did very well with one treatment to her hands to minimize the pigmentation present. Benign pigmentation or solar lentigines are very commonly found in patients living in Charlotte, NC. Wearing sunscreen with SPF of at least 30 helps to protect the skin from not only skin cancer, but also from the cosmetic changes seen from sun exposure. 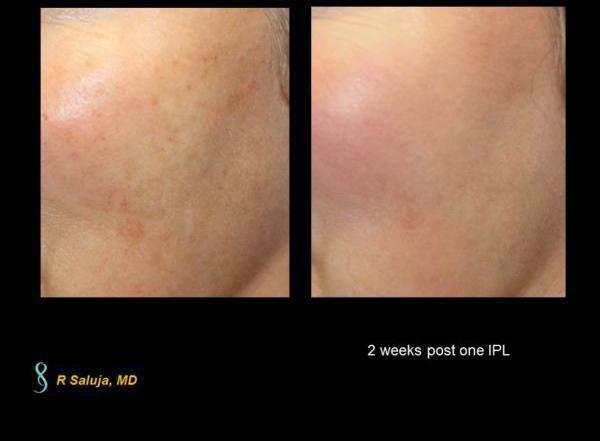 This Charlotte, NC female was bothered by her sun spots and wanted to have a Palomar Icon IPL treatment to minimize the appearance of sunspots. 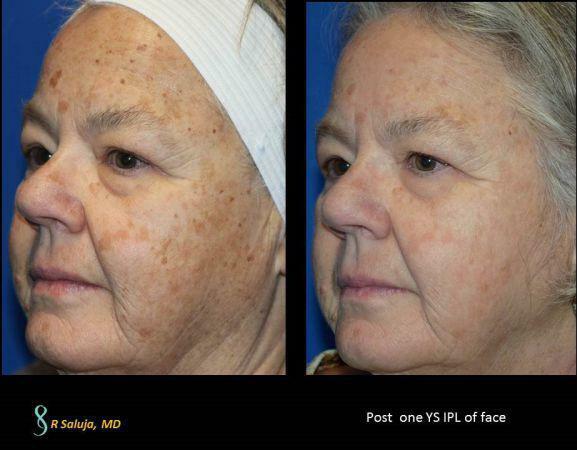 While we recommend a series of 1-3 treatments, these are her visual results immediately post one Palomar ICON YS IPL and 4 weeks post.